A boarded-up building in Cleveland, OH. Photo: Getty. There is a digital divide in America. Households in the bottom 20 percent of incomes are five times more likely not to have access to broadband than those in the top 20 percent. Yet this divide is often thought of as a rural versus urban divide. Yes, it’s expensive and difficult to run cables to every rural community, so providing broadband access there is a much bigger task. But the disparity in access persists in urban areas, too, where the distance between low and high income neighborhoods can be measured in both meters and dollars. And a new report out today from the National Digital Inclusion Alliance (NDIA) highlights a crucial and troubling fact: internet providers are failing to expand decent internet to poor areas, where it doesn’t help their bottom line. 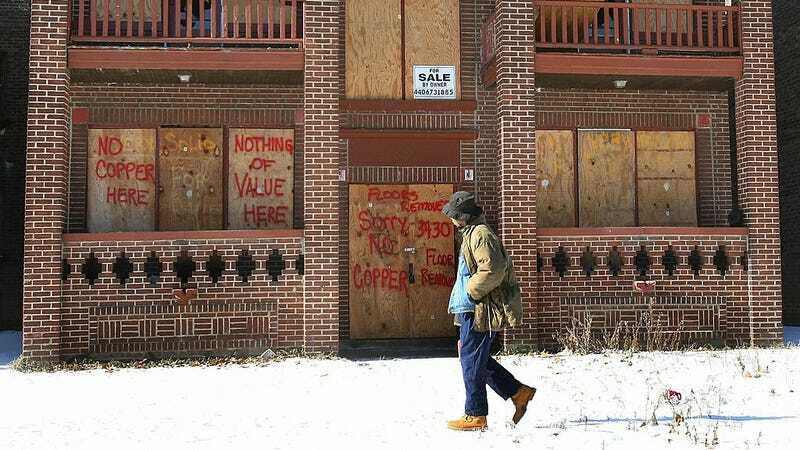 The group, a non-profit that advocates for more equitable access to broadband, published a report arguing that AT&T has “systematically discriminated against lower-income Cleveland neighborhoods in its deployment of home Internet and video technologies over the past decade,” which it deems “digital redlining.” Redlining generally refers to the historical practice of banks determining which areas had high proportions of black residents (i.e. drawing a red line around them) and refusing to provide loans to people from those addresses. NDIA isn’t alleging that AT&T is discriminating on racial grounds, though the pattern also largely corresponds to racial makeup: white areas have higher speeds, black areas lower. Internet providers are required to submit data to the Federal Communications Commission detailing where they provide internet service. Using data published on March 3, NDIA mapped the areas where AT&T provides service above 18mbps (still slower than the FCC’s definition of broadband), and where it’s much slower, around 3 to 6mbps or even less. Speeds that low mean more excruciating buffering on streaming videos and more trouble using multiple devices at once (like streaming on a Roku and browsing Twitter on your phone at the same time, for example). To get technical: the 18mbps-and-up internet is provided through “Fiber to the Node” (FTTN) technology, where a fiber cable runs to a central box in a neighborhood and then travels to homes over existing copper wires, using technology called VDSL (avoiding the extensive and expensive deployment of fiber cables that has plagued gigabit fiber projects, which are termed “Fiber to the Home” or FTTH). In the slower areas, customers only have access to ADSL2, where the speed depends on the distance from one of five Cleveland AT&T “central offices” because it travels over copper wires: at distances of more than a mile, speed drops to 6mbps, 3mbps, or lower. Essentially, that faster FTTN internet requires AT&T to deploy more fiber and more boxes. And in poorer areas, they just haven’t done it. The pink areas on the map represent areas where more than 35 percent of residents live below the poverty line according to data from 2015. (In 2015, this was defined as $24,250 for a family of four; the statewide average poverty rate was 14.8 percent, so these areas are significantly poorer than average.) The green areas show where AT&T provides internet through FTTN, the faster technology, with the dark green bits indicating where the the faster service is available in poor areas; white areas on the map have neither fast internet nor a higher concentration of poor residents. A few areas in the suburbs have gigabit FTTH internet. As you can see, while there are many areas that are higher-income but still don’t get faster AT&T service, barely any of the poor areas have it. The difference between the city itself and the suburbs is even more stark: 55 percent of Cleveland census blocks had maximum download speeds of 6mbps, compared to 24 percent for the rest of Cuyahoga County. Zoom out on the map and you’ll see the suburbs are a sea of green. It shouldn’t need saying, but it does: The poor desperately need better access to the internet. Low-income Americans facing the daily crises of poverty, of how to afford enough to eat, how to pay for healthcare, or whether they’ll be able to buy their kids a birthday gift, are the ones who need the opportunities provided by the internet the most. Children need the internet to do their homework so they can get into college and get better paying-jobs; adults need the internet to be able to start small businesses, or access vital government information and services, which are crucial to the very poor. So maybe we can’t expect AT&T to sell broadband to the poor if it doesn’t make money for them. But what about regulators, like FCC chairman Ajit Pai, who has made closing the “digital divide” a key part of his rhetoric? Part of his “digital empowerment agenda” is “[s]ignificant tax incentives” to “spur private-sector gigabit broadband deployment,” but we still don’t know exactly what that means, and the FCC doesn’t have the power to give companies tax incentives. AT&T paid less in taxes than it paid its CEO in 2012, and in 2015 it fought to lower the speed of rural broadband it was required to provide in exchange for $428 million in federal money. (The FCC required them to provide speeds of just 10mbps, which is still very slow if you have multiple devices; AT&T felt it should only have to provide 4mbps). Can we trust companies to bring decent internet—not just super-fast, more expensive gigabit internet, but good, reliable broadband—to areas they so far haven’t bothered with without more than gentle nudging by regulators? Poor children need the internet to do their homework more than some Silicon Valley dork needs gigabit internet so he can invent a wifi-connected bidet. They can’t wait around for telecom suits to decide it’s profitable to provide decent, affordable internet all by themselves. When doing the right thing doesn’t turn a profit, it’s up to regulators to step in.